I finally finished my Trillium sweater! Next, of course, I had to find something to wear with it. 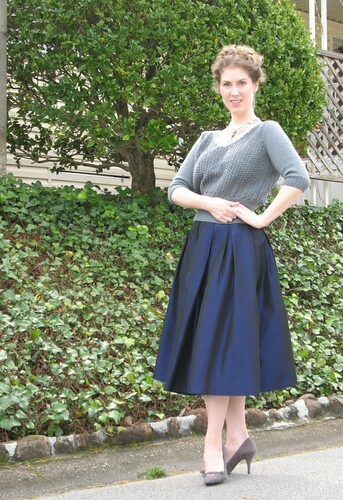 This taffeta skirt does not get much wear, so I thought I would pull it out of the closet. Trillium is a really pleasant knit. The stitch pattern is easy, but with enough texture that did not bore me to death as I was knitting away. As much as I love a brainless stockinette or rib stitch (the perfect project while watching a movie) they do get a bit boring after a while. And I am quite sure that I will be using this pattern again! Last year's sewing was incredibly prolific, and I have been feeling rather lazy in comparison these last few months. But I am spending much more time with my knitting needles, so although the finished projects are not coming as often, I am enjoying the process. Which is, perhaps, more important than new dresses! Very pretty. 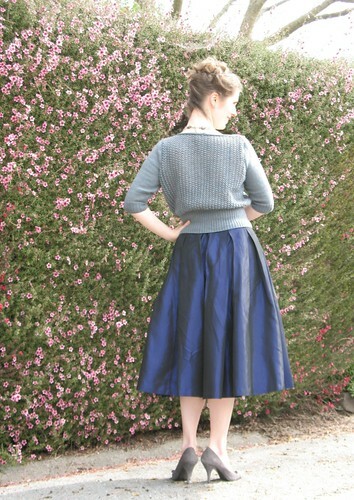 I just checked out some of your other knits on Ravelry - very cute! Lovely, and the skirt looks stunning with it. I shall start knitting, soon. So very lovely! 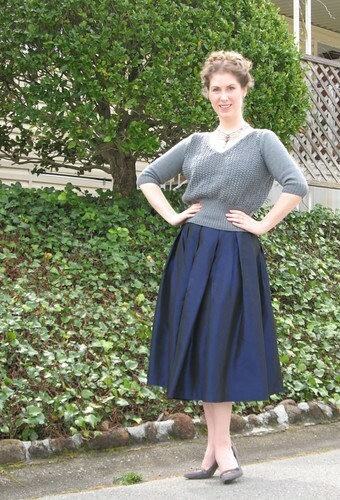 I adore garments that balance coziness and elegance perfectly like this wonderful sweater. Wishing you a beautiful start of April!